Does my cat need a cat bed? Cats, I find, will take a nap just about anywhere. Our homes are their territory. However, with a bit of trial and error, we found a bed our girls liked the best. It was a simple little nest that hooked over the radiator. Warm and cosy with a fleece material, we have found a similar one for you in our article. That said, we often found them snoozing up high or on the bed of their favourite human. 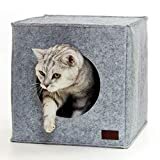 Choosing a cat bed therefore, may be a bit of trial and error for you too, but I think it is nice to give our feline friends a soft, safe space to call their own, especially as we all know how much they love to take a cat nap! A personal favourite as this is where my old girls loved to sleep. Simple and basic, an inexpensively cosy option just hook the metal frame over the radiator and the warm polyester fleece cover (washable – bonus!) will keep puss happy while she sleeps. Oh wow! Talk about storage solutions..! Well our house is full of IKEA furniture and this cat bed fits neatly into a Kallax sized hole. So if you want to streamline your home, including the cat’s basket, well take a look at this neat and modern design. The Grey colour has not gone unnoticed as it blends with any decor. It is made from polyester felt which means no loose threats for puss to get his claws stuck onto, and a pillow for added comfort. I love the cozy cave like nature of the bed, a winner for most cats I’d say. At Buskers Cat we like to find products that are a bit different. For our cat beds review, this is our choice! Not, strictly speaking, just a bed, this lounger serves as a purrrrfect place to scratch and also a place to rest. At first glance I thought, this doesn’t look so comfy. But the ergonomic design looks both sleek and sleep-inducing! Made from recycled cardboard and non toxic glue, it is also ecologically friendly. This product will keep your cat from scratching the furniture and give him a comfortable place to rest. Easy to install as no assembly required. This is something a little ‘outside the box’ in terms of a traditional style of bed, but cats love it! Multiple benefits for your cat as it acts as a scratcher, lounge, bed etc. Includes premium USA organic catnip leaf. Natural scratching for your cat healthy claws, great exercise, and stress reliever. Recommended to save your furniture from scratches as cats prefer the feel of cardboard. Curves make for easier scratching and also provides a more comfortable place to rest and play. 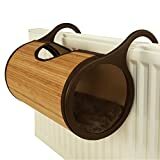 PetFusion Ultimate Cat Scratcher Lounge (86 x 27 x 27 cm, Walnut Brown). Superior Cardboard & Construction, significantly outlasts cheaper alternatives. 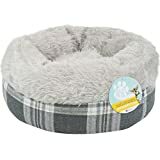 This a deliciously cozy and soft doughnut style cat bed with a thick, non slip base. It is machine washable. The exterior is striped beige in colour. I have to say I wish this classic style of cat bed came in human sizes! It looks cuper comfortable and is highly rated by cats and their owners. This 2 -in -1 design can both be a cat cave and a bed mat. Zip it up and make a tunnel for cats who like to hide, or open it out into a comfy mat instead. A budget, good value product. We loved our traditional, simply designed radiator bed, so this caught my eye! 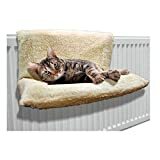 A bed which hooks over most radiators, a cozy tunnel design made of bamboo and eco fibres, with a soft and comfortable cushion inside – what more could our feline friends wish for?! Such a neat design it looks like a little piece of modern furniture. I like these beds for being off the ground hence space saving, and being raised up I think appeals to cats more, too. A win-win! 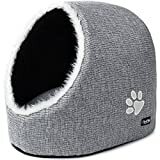 A snuggly, peaceful private little cave cat bed that suits a modern interior with the grey material exterior. It is easy to clean with a washable interior cushion. The whole cave is soft and cosy, and has an anti slip bottom. Give your pet a sense of security with this lovely modern bed, ideal for smaller spaces. Ideal for sleeping and napping, relaxing, or daydreaming. Wonderfully fits into any room of your flat/house. Your feline friend deserves the best to get some beautiful sleep. A Cozy, warm and comfortable, pet bed is a must-have for your four-legged friend, as it shows love and care. While many models promote better sleep, they become flat and uncomfortable the more your pet uses them. What’s worse, they hold odors and are impossible to clean hence it is good to buy a long lasting bed, easy to clean and still comfortable for your cat, we sampled a few of our best 7 above for our pet lovers that suit various personalities and budgets.